I once held a poll asking my readers which subject they found to be the most difficult to teach. Writing was one of the top two. Is this true for you, too? If so, then this is one review you want to continue reading. 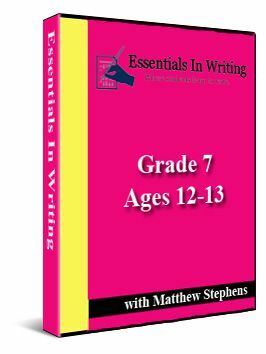 Essentials in Writing is an incredibly useful writing program founded by a previous middle school English teacher. It's available for students in grades 1-12. We used the Seventh Grade Curriculum which is recommended for ages 12-13. We have tried several writing programs in the past. Here is what makes Essentials in Writing stand apart from the others. Each lesson lasts only between 10 to 15 minutes. This helps to keep students from becoming too overwhelmed by being given too much information at one time. Mr. Stephens walks the student step-by-step through each new concept. Writing assignments are broken down into manageable pieces. Some assignments can be completed in one day, while others are spread throughout several days, depending on the topic. The student is encouraged not to move on until he has a complete understanding of the concept taught. Answer sheets are included for the assignments. Each assignment includes a sheet explaining the lesson taught on the DVD. Reading this prior to watching the DVD helps the student know which concepts will be covered during each lesson. Here's an example. It includes a supplemental grammar section. Note: It does not include any written assignments for this portion. The program is affordable. Unlike other writing programs, Essentials in Writing is only $40. You may also purchase a pre-printed workbook for $20. If you email Mr. Stephens with a question, he will respond directly to you. Below is a video showing a sample lesson from the Seventh Grade Curriculum. My son watched one lesson at a time followed by the completion of a worksheet assignment. Each lesson included between 3 and 5 worksheets. For the first few lessons, it took him between 15 and 20 minutes to complete a worksheet. However, some lessons took longer. For example, the lessons covering the concepts on how to write a personal narrative took him several days to complete as they involved drafting, revising, and writing a final copy. I must admit that my son does not enjoy writing, however I was very pleased to see the understanding of some of the concepts he learned appear in his writing. For example, in the personal narrative lesson he was reminded about the use of transitional words. See if you see any in his personal narrative below titled, My Scariest Memory. One day in May my brother was in the kitchen. He started running and tripped over the floor molding which leads from the kitchen to the living room. He hit his right eye against my knee. Shortly thereafter, my brother began sweating a lot. "I want to go to sleep, dad." he said. My family was scared because that wasn't like him. They took him to the eye doctor. While there he vomited on my dad. The eye doctor then recommended that my brother be taken to the emergency room. They took him to the hospital where he had several tests done. The doctor decided that he should be taken to the children's hospital, so he was taken there by ambulance. That evening I stayed at my friend's house. I was really worried about my brother. The next day my brother came home and felt better. I was so relieved! This is one of the scariest memories I have. I never want to experience something like that again! If you're searching for a writing program, I recommend you take a look at Essentials in Writing. If you have any other questions about this program that I didn't cover here, please let me know in the comment section. To read Crew reviews about the other grade levels offered, click on the banner below.